I LOVE BACON! If you follow my Instagram or Twitter accounts you probably already know that. It’s heaven in a slice!Â I love it for breakfast, lunch, dinner, snack, when I’m not hungry, when I am hungry…I have bacon socks, bacon lip balm, a bacon pillow that talks, I think you get the point. Here I was, minding my own business in the cab on the way to 14th Street when a bus pulled up next to us. I casually glanced to my left and noticed the bus was wrapped in an advertisement. Normally it’s an ad for LuLu Lemon or a picture of the cast of How I Met Your Mother (Now at 5&6pm in syndication) but not this time…not this time. It was an ad to prevent Pig Cruelty. There were pictures of abused pigs in spaces the size of a bus seat. THEY CAN’T EVEN TURN AROUND! The bus followed us for a good mile. We stopped. It stopped next to us. Wilber and Babe were taunting me while I was on my way to go eat their delicious cousin. I thought I could still do it. I thought I could enjoy slabs of bacon after looking at the bus. I thought I was unaffected…and then I sat down and looked at all of the pig items on the menu. I couldn’t get the bus out of my head. THEY CAN’T TURN AROUND! We left. I’m not giving up eating Pig. 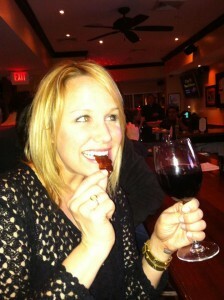 In fact, 2 hours later I was able to eat my beloved bacon. It was delicious. I’d like to think it’s because my pig was happy. I’d like to thinkÂ it was rolling around in dirt, making friends with spiders named Charlotte, using phrases like “That’s All Folks”, falling in love with a frog named Kermit…not riding a bus where it couldn’t turn around. Animal Cruelty is wrong BUT so is ruining peoples appetites! How about have a picture of a cartoon pig smiling with the caption “Happy Pigs Make Better Bacon!”? Sum- it might be my favorite pillow ever! Thank you!